Design a functional and creative Murphy Bar with Krylon®! Before you begin ensure you are following all safety precautions while using saws and power tools. The first step is to cut four 1x8 boards to form a rectangular box using a miter saw. Use a pocket hole jig and set it to 3/4 inch stock. Drill four of these pocket holes at the ends of the two shorter 1x8 boards. Attach the boards into a rectangle with wood glue and 2 1/2 inch long pocket hole screws in the holes made with the jig. This will secure the four boards together to create the rectangular frame. Cut out a 3/4 inch thick plywood board which will be used to cover the back of the frame. Cut the board so that it is flush with the edges of the frame. An optional feature to add is a cleat system to mount the Murphy bar flat against a wall. Cut a 45 degree cleat attached near the top. The space between the two boards is for the cleat to be mounted against the wall to fit into place. If this process isn’t for you, simply use strong hooks to hang the Murphy bar against a sturdy wall or surface. Attach the plywood backing and or cleat flush with the back of the frame using pocket holes and securing it to the frame for added strength. Use 1x8 boards cut to the length of the frame for shelving. Attach boards inside frame using wood glue and ¾ inch pocket jig holes drilled into the frame with 2 ½ inch pocket hole screws. Repeat with two or three more boards. Vary the heights of the shelving to fit your bottles and supplies. For added detail use a jigsaw and carve out wine glass holders ½ inch by 3 inches. Space the slots out to hold multiple glasses. Set this frame with shelving aside for later. The front of the cabinet is constructed out of 1x8 and 1x10 boards. Connect them into a large open rectangle with wood glue and pocket holes. In the open space of the rectangle you will later attach an acrylic panel. Use a router and rabbet bit to create a lip for the acrylic panel to sit in. The lip should be the same depth as the panel. Use a hand chisel to square up each corner after routing. Attach panel after spray painting process. The leg frame of this table will sit on top of the table board and swing down to support the table. Create a rectangular frame from 1x4 boards. Make the area of this rectangle smaller than that of the table frame. Attach the boards with wood glue and 1 1/4" long nails. The leg is connected at the far side of the table with 3 inch hinges. For added strength for the table attach a lid support to each side. This will lock the legs in place at a 90 degree angle when the table is being used. Sand down any rough edges to create a smooth surface to paint. 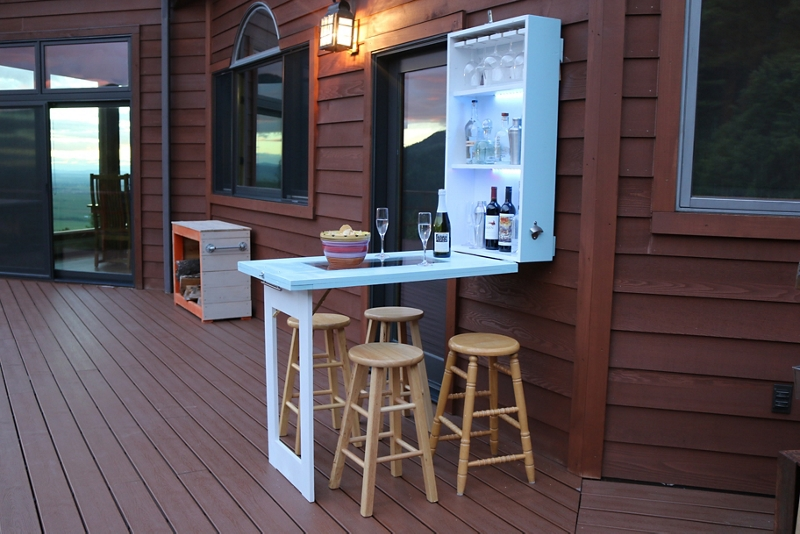 Apply three coats of Krylon Outdoor Décor in Satin Rainwater to the outer edges of the cabinet and to both sides of the table. Spray three coats of Krylon Outdoor Décor in Satin White Cloud to the inside of the cabinet, including shelves, and the leg frame. Allow to dry. Once fully dry attach acrylic panel into the space with clear epoxy and allow to dry. Accessorize the cabinet with optional handles and hooks for extra storage. For an optional feature add LED lights across the shelves for more detailed look! Add a 45 degree cleat to the wall or siding. It will need to be at the correct height so that the table legs touch the floor and are at a 90 degree angle with the table top. If you did not install a cleat, simply use nails or hooks to install the bar onto your wall of choice. Open up your brand new Murphy bar and enjoy the outdoors with friends and family!